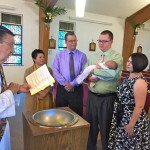 The darling baby girl’s name is ELLIANA ROSE… and Deacon Tom was blessed and honored to be able to baptize her, along with Dee’s help this past weekend. This and a few other areas set our minds on a very good Catholic Vitamin: CHEERFULNESS… And our guest to help us consider this area is Fr. Patrick J. O’Doherty from Ocala, FL. He tells a ‘tale’ of a fluffy white bunny… a silver wolf… well, just listen in. 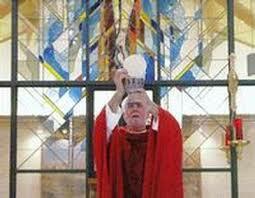 Would that all our CV friends could visit Queen of Peace Parish in Ocala. We’d love to introduce you to Fr. O’Doherty. But for now – all we can share is our love for the Church itself …. it’s almost like a cathedral. 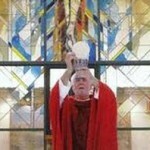 Here’s the web address for QoP: www.ocalaqueenofpeace.com Make sure to read the history of the parish as written by Fr. O. Music on Catholic Vitamins is always by permission of the performers. We thank them. This CV show contains the homily delivered at the English Masses at our parish for Sunday May 1, 2016. Among other topics, Deacon Tom spoke on the Holy Spirit (thanks fo Fr. Francis Martin for insights) and on the Bleeding Host miracle in Legnica, Poland.